We’re a charity on a mission to bring clean water to impoverished communities in the Caribbean. Thanks To Donors Like You, We Are Rebuilding Lives, One Brick At A Time. Construction Of A New School Building Provides New Opportunities. Without question, Haiti is the most impoverished country in the western hemisphere. Almost half of the 9 to 11 million Haitians lack access to clean water. We have worked hard over the last 13 years to change that, installing 333 artesian wells throughout the country as well as reservoirs which serve hospitals, schools, and larger communities. 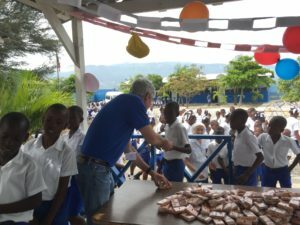 Indeed, in the 13 years that we have been in Haiti, we have provided potable water for over 500,000 Haitians. Four million people in Haiti live without clean water. Learn how clean water changes everything. Make this year’s birthday special – give up your birthday gifts for clean water. It starts with a birthday. Run a 5K, throw a dinner party, or get creative! No matter the campaign, you can get involved. 100% of each and every dollar goes directly to building clean water projects. All overhead costs are provided by private investors. We partner with local nonprofits and contractors to build each project, thereby making efficient use of your charitable dollars. We allocate every dollar to a specific water project and always maintain proof of project completion.